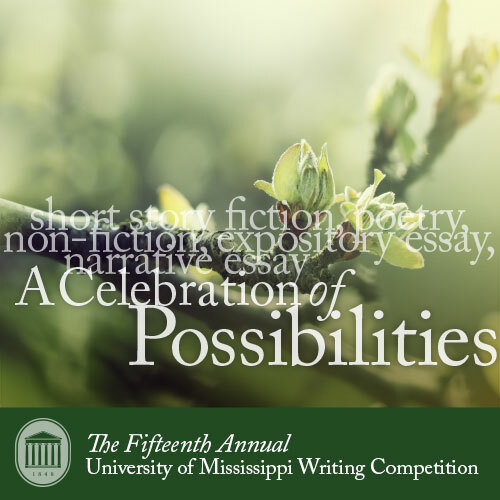 The University of Mississippi Writing Competition is an annual teachers workshop and mail-in competition for the state of Mississippi and neighboring schools in the Alabama, Arkansas, and Tennessee areas. All projects listed above must adhere to the Writing Competition theme listed at the top of the page. The University of Mississippi Writing Competition Teachers Workshop provides educators with the opportunity to learn how to incorporate the competition and theme into their classroom. The workshop is not mandatory for teachers to attend in order for their students to compete. Entries will be judged on literary merit and usage/grammar appropriate to grade level. The work is not to be taken from or based upon any writing by any author famous or unknown, student or adult - or from any published or unpublished source such as a book, magazine, literary anthology, or the like. Judges will be teacher consultants from the University of Mississippi Writing Project. The competition is open to students currently enrolled in grades 7th-12th. Double-spaced on one side of paper only. No double-sided printing. NO NAME should appear on the entry itself. Entries with names will be disqualified. Titles are required on the entry and should match the title provided on the submission form. Titles should be punctuated correctly. No underlining or quotation marks of titles on original work. Entries should NOT be bound or laminated and should NOT include a cover or filler sheet.